For many years, this was my holiday coping strategy. Eventually, age brought some long overdue wisdom with it and I learned to pace myself for the holidays. Although the internet enables us to accomplish some of our extra holiday tasks with ease from our homes, many of us still struggle getting through all the social events laden with yummy holiday fare without wearing the residual effect as extra poundage that magically appears when we step on the scales in January. How can we enjoy our social fun without it being problematic? For me, learning to avoid certain food groups was a great beginning. Sugar being the number one culprit for me. Recognizing the addictive nature of sugar and how addictive I am to it, reminds me that avoidance is easier than limiting. Food allergies caused me to eliminate nearly all processed foods from my diet, which was an amazing health boost. An inadvertent side effect of this was the elimination of additives and preservatives. For years I struggled to maintain a healthy weight having no idea that these same additives and preservatives were chemically addictive. This means that when the commercial says, “bet you can’t eat just one”, they know full well you can’t eat just one. Not because it tastes so great, but because of the chemical addiction associated with the preservatives. Learning how addictive these chemicals are was shocking, but not nearly as maddening as knowing many of them are also appetite stimulants. It was quite an ah-ha moment for me to realize the problem wasn’t my lack of will power at all, but rather a chemical addiction. Knowing this makes it much easier for me to make the very best choices possible when I attend these social events. Because I anticipate the host not being savvy to my particular dietary needs, when I offer to bring something, I make sure it is something that meets my own specifications and then I try to make the very best choices of what’s available. I also find it easier to resist when I arrive having just eaten a large salad or some vegetables so I am not led by my hunger. Try filling up on fun and fellowship rather than food and beverages. 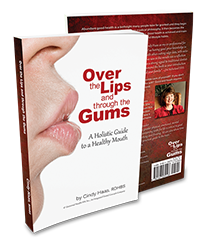 For these and more tips about small daily changes you can make to improve your health, consider putting my book Over the Lips and Through the Gums on your Christmas wish list. Happy Holidays!